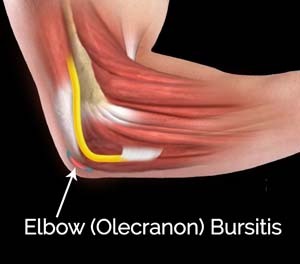 To diagnose elbow dislocation, Dr. Patel will examine your arm. Dr. Patel will check the pulses at the wrist and will evaluate the circulation to the arm. An X-ray is necessary to determine if there is a break in the bone. An arteriogram, an X-ray of your artery, can be helpful to know if the artery is injured. At home, you may apply an ice pack to the elbow to ease pain and swelling. However, it is important to see Dr. Patel for help. You can also check if the arteries and nerves are injured or remain intact. You can feel your pulse by pressing tips of your fingers at the base of your wrist. They should turn white or blanch and a pink colour should come back in 3 seconds. To check for nerves, first bend your wrist up and move your fingers apart and then touch your thumb to your little finger. You can also check for numbness all over your hand and arm. If you have a problem with any of these tests you need to see Dr. Patel right away.